Gone are the days when developing an app took multiple days and even weeks. Today, the world of mobile app development is filled with stunning open source front-end SDKs(Software Development Kits) and frameworks which have made it possible for the developer to build an awesome app within a few minutes. Ionic is one such HTML5 App Development Framework that allows you to create high-performing and extensively intuitive native-like mobile apps. If you’re new to Ionic and want to dig deeper into this most used and recommended framework, then get on with reading the paragraphs that are listed out in this post. Let’s get started! As a powerful front-end framework built on Apache Cordova/PhoneGap, Ionic allows you to create a mobile app using the web technologies that you’re familiar with. Additionally, with Ionic, you can even opt for deploying your mobile apps using AngularJS. Created by the team which has already delivered successful projects like Codiqa and Jetstrap, Ionic is utmost capable of handling the entire look and feel along with the UI interactions that are required for your mobile app. Quite similar to “Bootstrap for Native”, Ionic is equipped with impressive support for a wide range of slick animations and native mobile components. Ionic Framework – What all does it include? Gestures – Ionic comes with Hammer.js that offers an incredible gesture support for swipe, tap, drag, drop etc. A set of UI components – Ionic is loaded with brilliant UI components including modal, radio, tabs, navigation, action sheet, cards, headers, toggle, range, slide boxes etc. 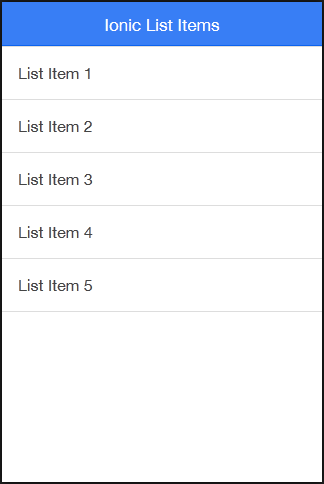 View Stacks/State Management – Ionic comes with built-in state management for different views. This feature allows you to keep a good track of the navigation history along with the flexibility to push multiple templates into a single app page. One of the greatest advantages of the Ionic framework is that it can be easily hooked up to the most common and well-known back-end technologies like Ruby or Node. People behind Ionic are confident enough that the innovative design patterns incorporated within the framework are beyond the boundaries of applauds. Plus, there is an additional flexibility of adding a custom CSS in addition to overriding the default properties. Although Ionic’s default design is quite similar to that of iOS, it’s quite easy to extend the CSS to get the look and feel you desire to have for your mobile app. With its core written using Sass, Ionic comes with tons of mixins and fully-customized variables that make it a powerful and robust HTML5 mobile app development framework. When it comes to creating native apps using HTML5, nothing can beat the Ionic Framework. Hope by now, you’d have gathered an in-depth understanding of Ionic and its growing significance among the HTML5 app development community. Author Bio: My name is Amanda Cline and currently I’m employed with Xicom Technologies Ltd- A reputed IOS and Android Application Development Services provider with an excellent track record.